Jake Winn was selected by his fellow employees to be a 2016 Star because of his compassion and willingness to help others. September of that year. Subsequently, he enrolled in an EMT Advanced class, which he completed in July of 2014. Realizing how advanced life support can improve patient outcomes, Jake promptly enrolled in Paramedic school and is scheduled to graduate this July. 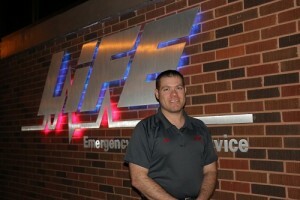 A dedicated husband and father of three children, Jake manages to balance family life, school and his job at Life EMS. He also works at Pond Creek Volunteer EMS. In the little spare time he can find, Jake enjoys the outdoors, including fishing and hunting, and is an avid OU football fan. Life EMS is honored to present Jake Winn as one of its 2016 Stars of Life.